Yesterday night we had a nice, simple supper. 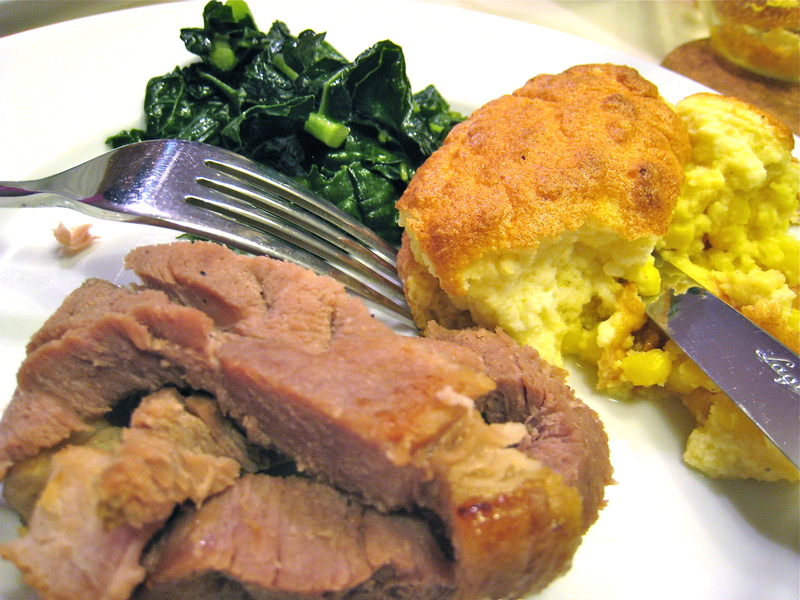 A High Point Farms ham steak, with sides of sautéed kale and corn spoonbread. The ham, moist and flavorful, cooked quickly in a large cast-iron pan over medium heat (it’s true that with pasture-raised pork and grass-fed beef, you should drop the cooking temperature a bit because it is so lean). What I love most about these meats that we have been getting from our CSA is that in the sausages, bacon, and ham, there are only about as many ingredients as I have fingers on one hand: beef or pork, salt, brown sugar, spices. Nothing unpronounceable, nothing that anyone would have difficulty recognizing as food, and everything tasty. Kale is a favorite leafy green of mine, both delicious and nutritious. Some people deride it as diet food, but if you add some ham hocks and stew the heck out of it until it becomes rich and luscious, you have yourself some fine eating right there. I like it that way, but I also love it sautéed so that the stems retain a bit of their tangy crunch and the juicy leaves stay springy. This was the first time that I tried a corn spoonbread recipe and I have to say that it was definitely more like a corn soufflé than a bread. I had been warned before though. It was still good (airy and ethereal), but left me sadly unsatisfied as I was looking for more of the heft and heaviness of cornbread, just not so much so. For that reason, I am only including a link for the recipe here. If I had to make it again, I might let the corn meal/milk mixture (a lazy woman’s béchamel, if you wish) become much thicker before adding the egg yolks. I think that it would have benefitted from some fresh herbs, dill maybe as I do love corn and dill together. By all means, if you try it, use fresh corn from the cob if you can.